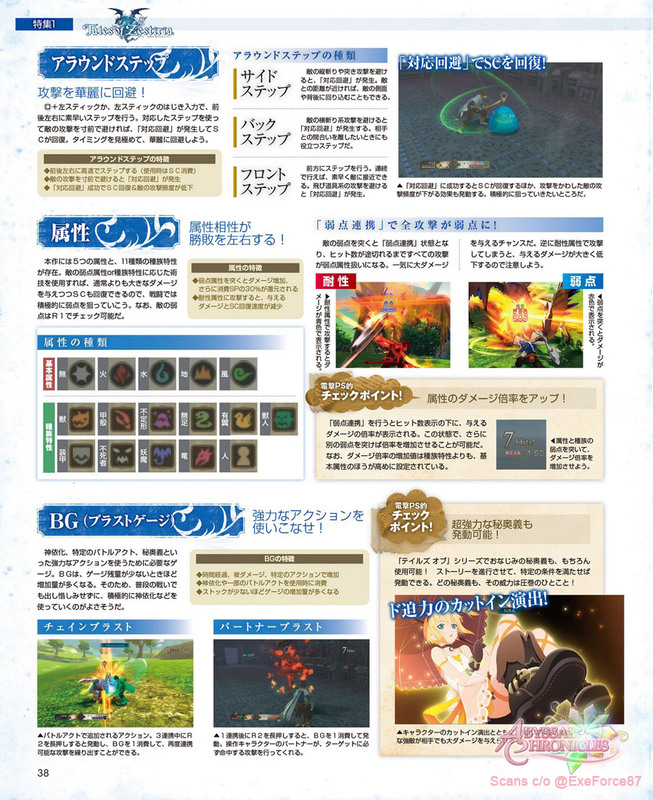 While most of this is an overview of what we already know, some bits in the spread gives us a bit of new info on the game. 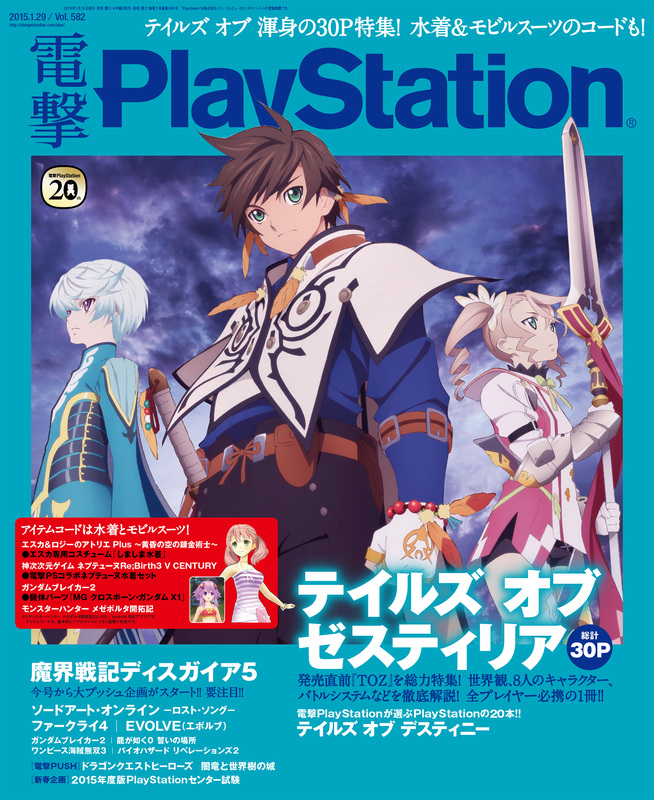 Also, to the interested, you can order the magazine from CDJapan. 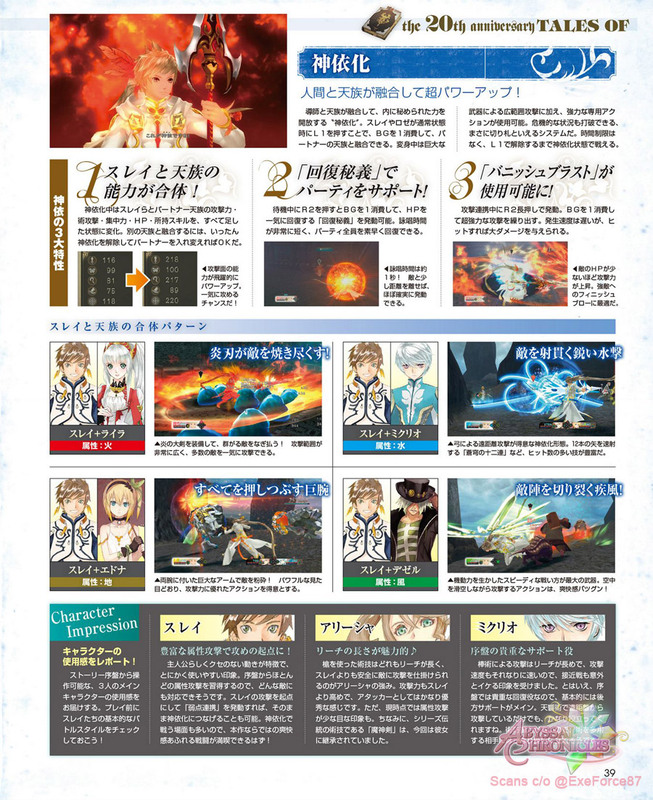 The first few pages are character introductions and keyword explanations such as the Hyland Kingdom and Rolance Empire, the Seraphim, the Shepherd, Armatization, the "Juushi" and "Baishin" concepts, the Hellion, the Normin, the Celestial Record, the dragons, guilds, areas in the game - basically nothing we haven't covered yet, so we won't get in depth on the above pages. 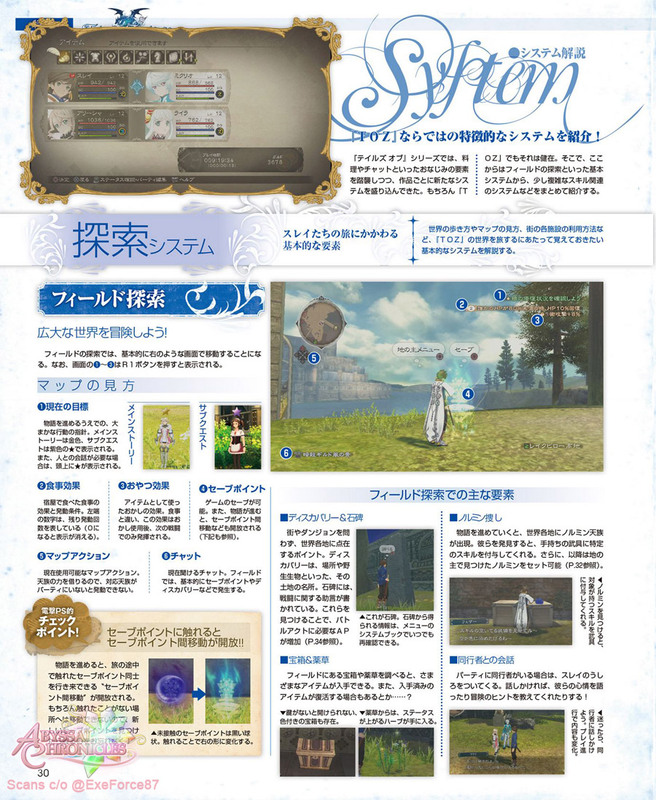 The next part of the spread covers the game's system, starting first off with the Field. On the upper left of your screen is a view of the map, and slighty below that, the symbol that looks like a D-pad, is for Map Actions. At the bottom left is an area for chats, save points and discovery area info. Pressing R1 shows additional stuff to the upper right of the screen, namely your current objective and food effect. Characters that trigger a main event have a gold star above their heads, while those that'll trigger a sub event have a purplish star. What else can you do on the Field? 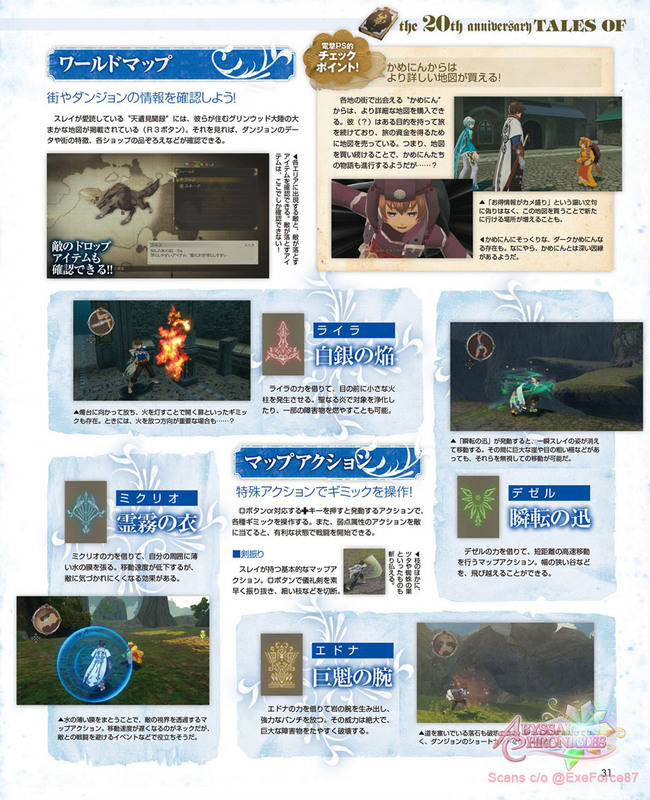 Check out Discovery Points, check out Stone Monuments that give AP for Battle Acts, find treasure chests (some chests may need keys), talking to Normin points which will give you equipment skills bonuses, or talk to your accompanying character to possibly get hints on where to go next. Map Actions are basically gimmicks on the field used in exploring, usually in conjunction with the power of a Seraph, to let you through some obstacles. 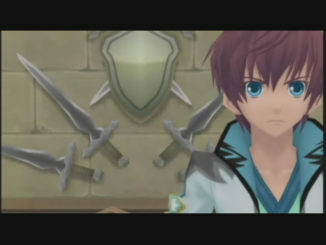 An example would be Lailah's fire which can be used to burn obstacles. They're activated by pressing Square + D-pad. We covered the Map Actions in a previous post. There is also, technically, a World Map, pieces of which can be bought from Turtlez, allowing you to visit new areas. Next up are Towns. Surprisingly, you can only eat Food at an Inn. And as usual, resting at an Inn recovers your HP and SC (Spirits Chain). Repeated use of Food will increase it. In addition, using Food or staying at the Inn may trigger a new Skit or a new Support Talent (to be explained later). InShops, buying and selling items will make the Shop Rank level up. Equipment can have various skills attached, and you can fuse two items to make them stronger. The scan also mentions a Land Chiefs (Seraphim's Protection) system. Throughout the world are places that have Land Chiefs that need to have the Seraphim's protection. Revive the said protection, and the Land Chiefs will be able to provide services such as warping between save points (for a fee), increase the Seraphim's Protection for that area with Grade earned in battle from that area, set up Blessings from the Land Chief which will grant various bonuses such as decreasing the save point warp fee or making treasure chests respawn, set up Normin for that area which can increase the drop rate of specific equipment or increase enemy levels, or offer items in exchange for Grade which can be used to level up the Protection. This is really extensive. 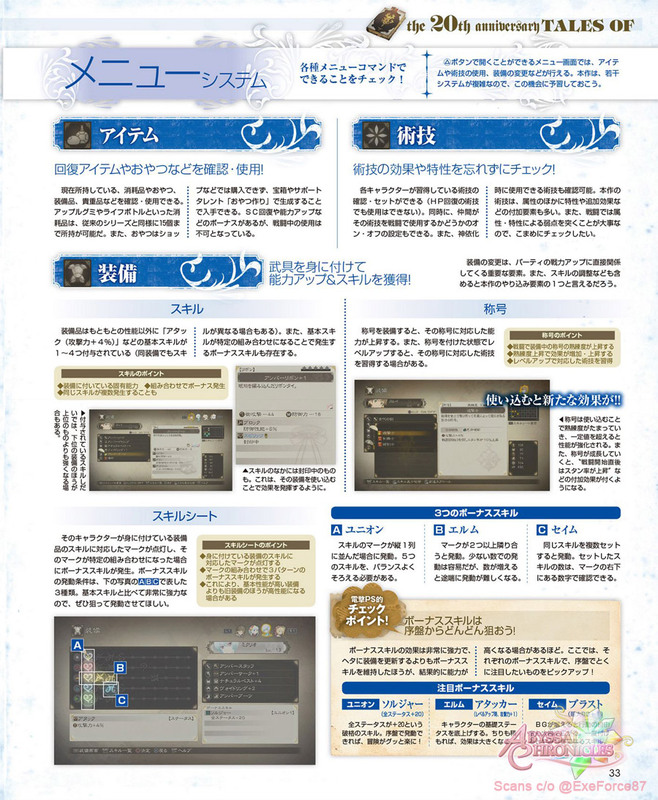 The scan also elaborates the game Menu, which is accessed by pressing the Triangle button. 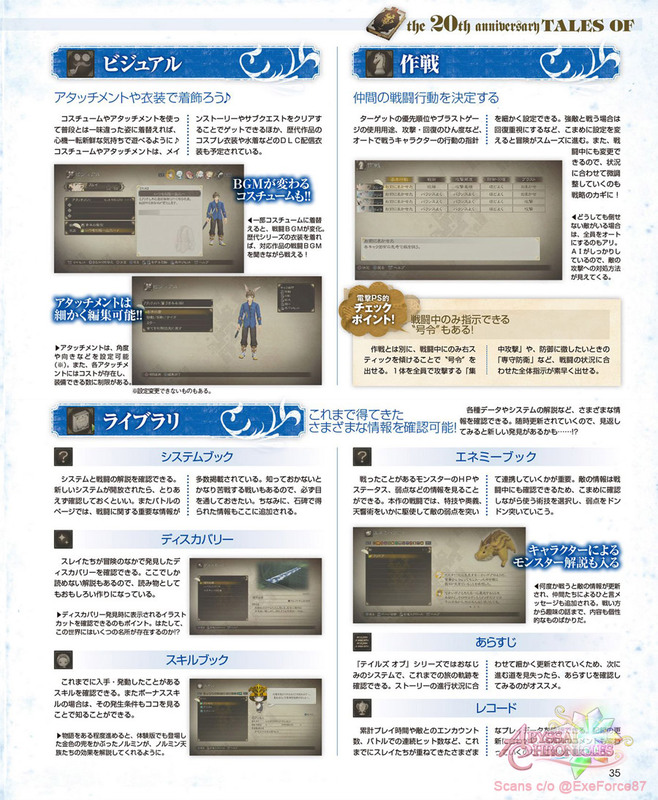 Aside from the usual Items and Artes, you can also access your Skills via the Menu. Skills are mainly attached from your equipment, with 4 skills in maximum. Some skills, when together, can result in a bonus skill, and some skills might need a specific number of use of the equipment before it can be used. You can view them via the Skill Sheet, where depending on the Skill, a part of the sheet will light up. Bonuses are obtained in three ways - Union, Elm and Same. Union activates when 5 skill marks are completed vertically. Elm activates when 2 or more skills join horizontally. Same activates when there are multiple of the same skill that is activated. 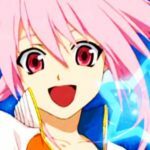 We then have Support Talents which are technical skills unique to a specific character. Only one may be equipped per character but you're free to change it any time. Said talents can also be leveled up to increase proficiency. Some examples given include Treasure Sense, where you will be told if there's a chest nearby. Depending on its level, it can increase the range of detection. Another was Design Sense, which is the same as the former but more for Discovery Points and Stone Monuments. Another isPeace Keeper, which will regenerate HP when walking in dungeons or fields or even tell you if a character's HP is low. Battle Acts are bonuses set that affect all party members in battle. New Battle Acts are learned at the end of battles by fulfilling specific requirements, and the AP needed in Battle Acts are from Discovery Points and Stone Monuments. An example Battle Act given is Free & Free which enables Free Run and Reviver wherein when you're knocked out in Armatization mode, the fusion is broken and the Seraph sacrifices himself/herself, leaving the human alive. Next, on to Battles. 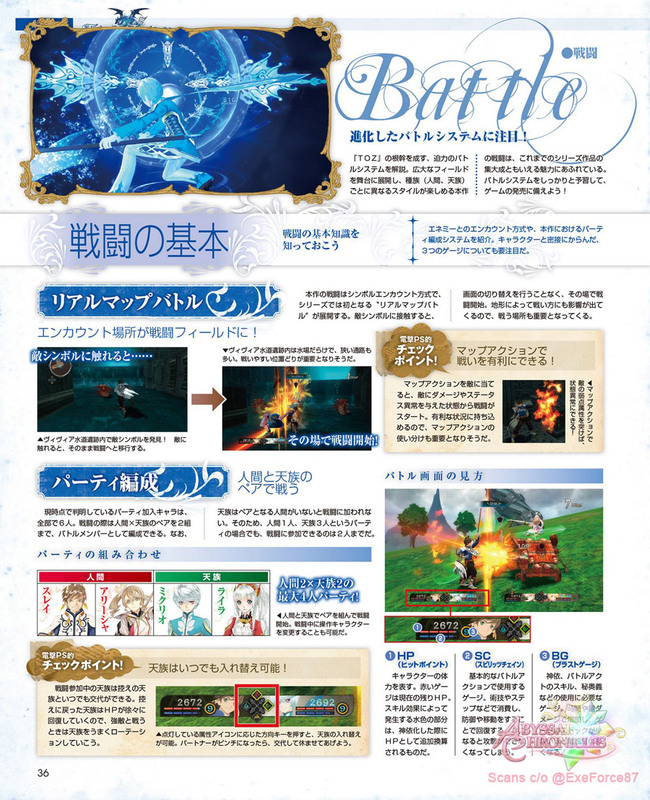 Tales of Zestiria introduces the Real Map Battles, which basically allows (almost) seamless transitions in between the field and battles, and whatever the field you're in, that's where the battle will take place. 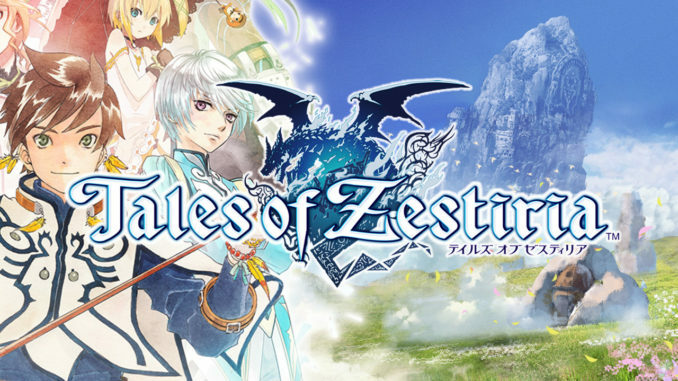 For Zestiria, however, there can only be a total of two humans and two Seraphim in battle. In the case, for example, you're currently with one human and three Seraphim, only two Seraphim will participate in battle. 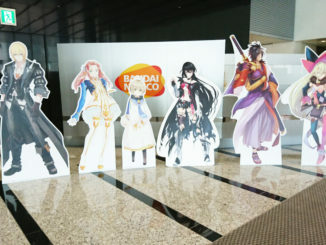 The character portrait area in battle have 3 parts. The red bar is your HP, while the blue one is your SC (Spirits Chain). The number is your BG (Blast Gauge). Depending on your SC, there are benefits or drawbacks. If your SC is high, you recover faster and the damage received is lessened, while if your SC is low, you give higher damage but recover slowly. The Around Step system has three types: Side Step, Front Step and Back Step. Doing them uses up SC. The BG is used up by Battle Acts or fusing and it fills up by certain actions such as taking damage. There's a Chain Blast that uses up 1 BG when you long press R2, which allows two consecutive combos, and a Partner Blast that makes sure your partner's attacks will always hit. 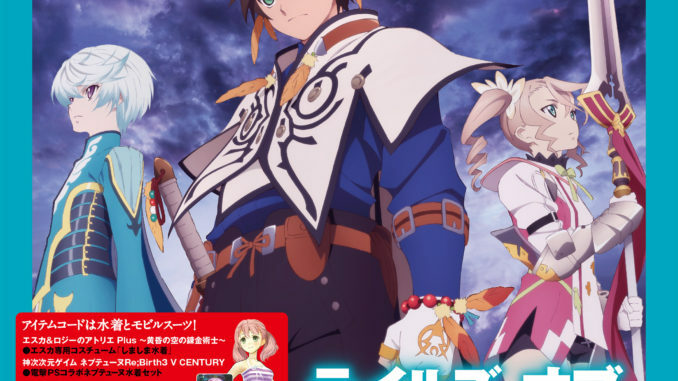 Armatization is the fusion of Sorey (or Rose) with a Seraph. It uses up 1 BG and is activated by pressing L1. Stats are increased dramatically while in this mode. 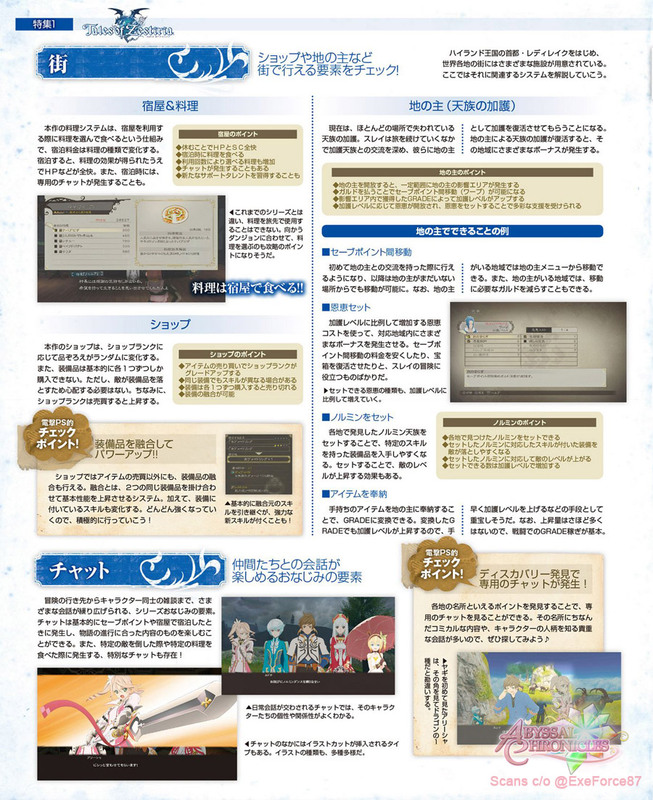 While in this mode, pressing R2 will activate a special Restoration Arte that heals party members for 1 BG. Long pressing R2 will activate a Banish Blast attack, a slow but powerful attack that uses up 1 BG. Whew, that was long. 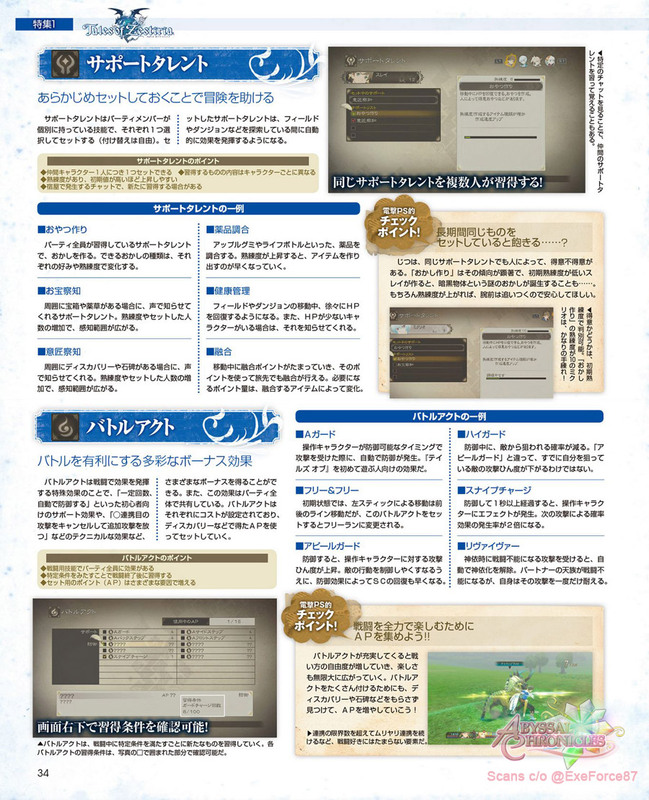 The remaining scans feature the upcoming DLC and an interview with Hideo Baba. 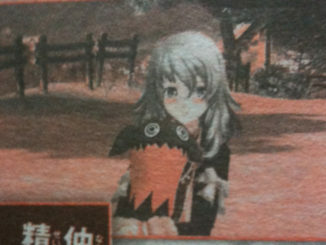 Thanks to @ExeForce87 for the scans! 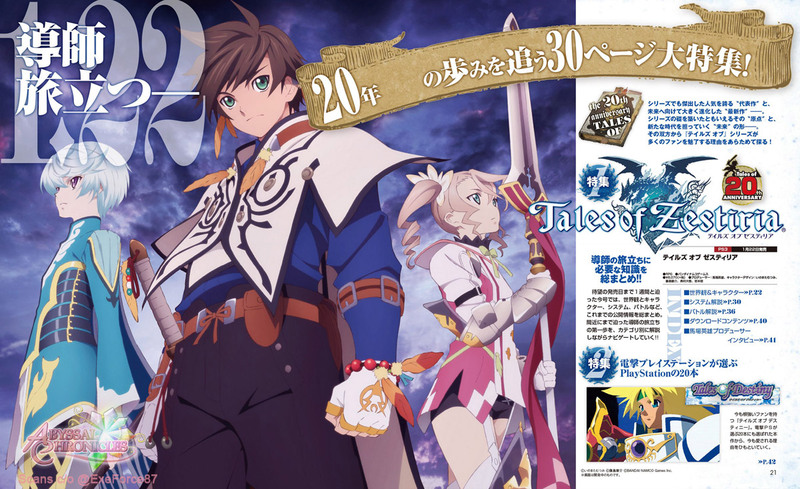 Only 6 days left until Tales of Zestiria is out! 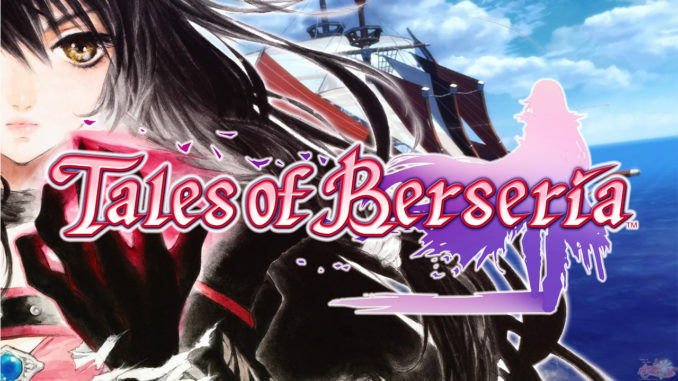 Anyone else also importing the Japanese version?